Bhringaraj oil, when used for few months, helps in regaining the original color of the hair, in case of premature graying. By massaging the scalp and hair with bhringaraj oil, it helps in relieving the mind from stress and anxiety depression. Bhringaraj oil is combined with coconut oil, sesame oil and herbs, such as amla and shikakai, for making hair conditioners. The oil also benefits people suffering from premature hair loss, balding, dandruff and dryness of scalp. 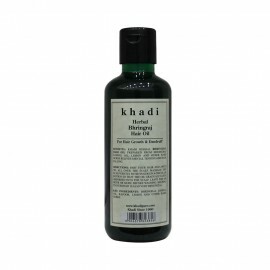 It nourishes the scalp and hence, avoids splitting of hair, thereby making it soft and manageable. Khadi Herbal Bhringraj Oil prepared from bhringraj sandal oil, lemon and other rare herbs relives me..
Khadi Pure Gramodyog™ Herbal Amla & Bhringraj Hair Oil helps to relax. Amla stop graying and dan..
Khadi Pure Gramodyog™ Herbal Bhringraj Oil prepared from bhringraj sandal oil, lemon and other rare ..
Khadi Herbal Amla & Bhringraj Hair Oil helps to relax. amla stop greying and dandruff, bhringraj..
Neev Ayurvedic BHRINGRAJ Hair Oil 100 mlDescriptionNeev Bhringaraj Hair oil preven..
Khadi Pure Gramodyog™ Herbal Ayurvedic Bhringraj Root Hair Oil has features pure bhringraj, butea fr..
Khadi Herbal Ayurvedic Bhringraj Root Hair Oil has features pure bhringraj, butea frondosa, amla, an..
Indus Valley Bhringraj Oil is a perfect solution to trust on when you want to avoid probl..
Neev Ayurvedic BHRINGRAJ Hair Oil 200 mlDescriptionNeev Bhringaraj Hair oil prevents pr..